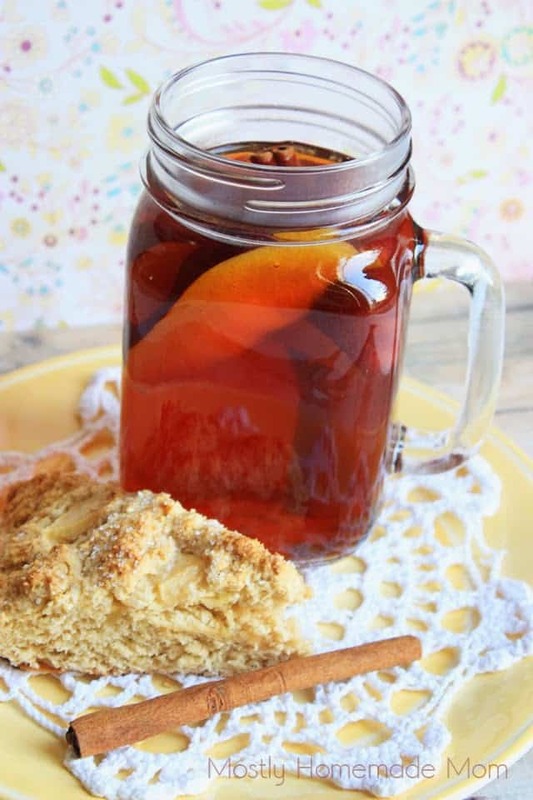 This typical hot tea gets a fall flavored twist with cloves, apple juice, and cinnamon – simple and delicious! Coffee is usually my poison of choice around here. And since the days are getting colder, and also shorter as the case may be, my coffee drinking is on the upswing. I don’t know what it is with chilly breezes and coffee, they just go together so well! Recently though, the creamer is getting me. One cup or two cups each day, with a tablespoon or two of creamer in each might not be so bad. But let’s just say I’m consuming MORE than two cups per day, and the creamer, with all the calories, add up! I think I was highly underestimating how delicious tea is and how wonderfully refreshing a hot cup of tea can be on a chilly day! I don’t like cream in my tea at all, so that solves the issue I’ve been having with my coffee. To sweeten it up just a bit, I used a couple of packets of Pure Via sweetener that I picked up on my last trip through Walmart. It gave it the right bit of sweetness with zero calories and a lovely flavor. Pure Via is all natural, Non-GMO, and made from the sweet extract of the stevia leaf – no artificial processing or preservatives involved. Love it! This deliciously simple Autumn Spiced Apple Tea brews on the stove and then gets combined with apple juice along with whole cloves and cinnamon sticks. 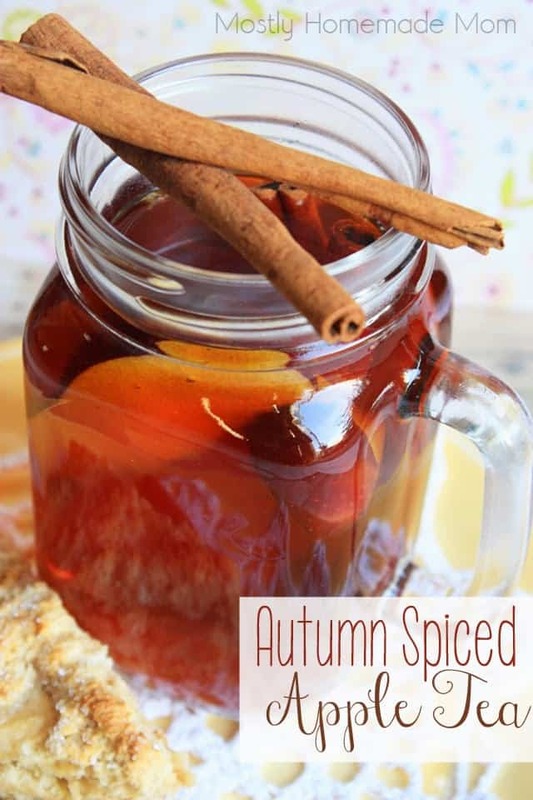 Not only will you have a hot cup of delicious fall flavored tea – your entire house will smell absolutely amazing! 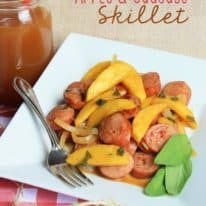 One batch makes two servings, but this can easily be doubled or tripled (or more) if you’re serving a crowd. Keep it warm in a slow cooker with a ladle for a wonderful warm party drink that your guests will go crazy for! Bring water, cloves, and cinnamon sticks to a boil in a small saucepan. Turn off heat, add tea bags, cover, and allow to steep for 3 minutes. Remove tea bags and stir in apple juice and sweetener. Turn the heat back on to low and simmer until heated through. 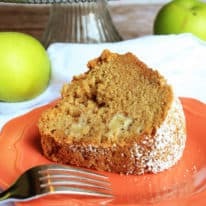 To serve, place two apple slices in the bottom of two mugs. Pour hot tea over apples, being careful to strain out cloves and cinnamon sticks. Serve with additional cinnamon sticks in the mugs if desired. 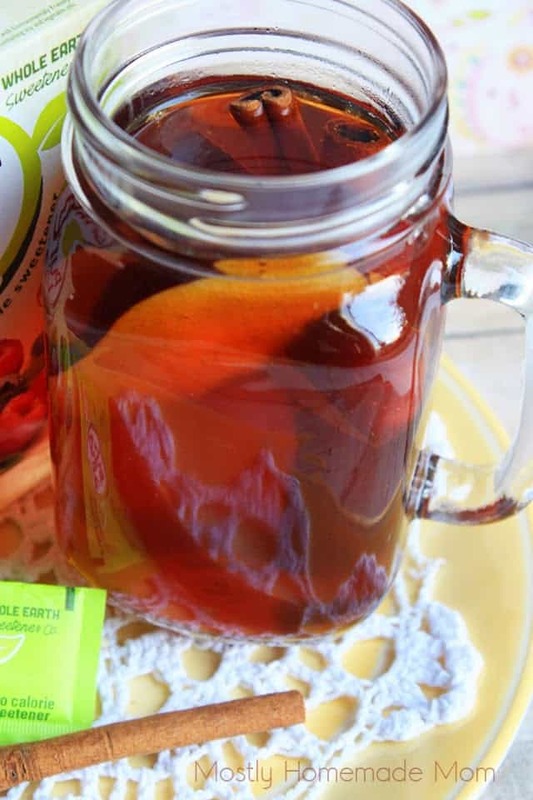 This tea is seriously one of the most delicious teas I’ve ever had – you HAVE to put it on your list to try this week! 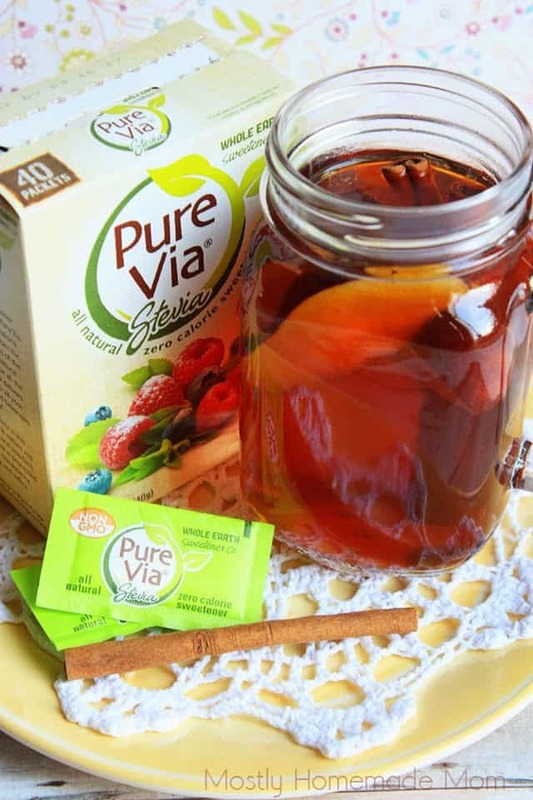 If you’re interested in trying Pure Via as well, be sure to grab a $.55 off ONE Pure Via 40 Ct. Packets coupon, available while supplies last. You can also download a free songbook/cookbook from Jewel by clicking here. Don’t forget to follow Pure Via through their Facebook and Twitter pages as well! Oh my this looks so yummy. My thought though is that cinnamon sticks are expensive…a little too much or an every day or even weekly drink. I wonder if it would be good by simmering the ground spices instead? You definitely could use ground cinnamon instead to cut the cost a bit, Jenny! Check your local dollar tree though, I’ve seen bags of cinnamon sticks there this time of the year and I usually stock up when I can get them for that price!